If Your Fridge Is A Stink Bomb That Explodes Every Time You Open The Door, It’s Time To Take Action! If the problem lingers after the rotten item is tossed, try one of these deodorizing methods. The best method for you will depend on the level of your stink! 1. Cotton balls. For a quick stink-fix, dampen a cotton ball with your favorite essential oil. Then, toss the balls into your fridge. The pleasant scent will fill your fridge! variety. Set the bowl in the fridge. The absorbent nature of the oats will grab and hold onto the smell. Just make sure to toss the oats when you’re done – you don’t want to serve stink oats for breakfast! 3. Lemons. Cut a fresh lemon in half, and then put the lemon juicy-side up in a bowl. Sprinkle one or two tablespoons of salt onto the lemon, and let the bowls sit in the fridge for several days. Not only will the odors dissipate, your fridge will also be filled with a clean, lemony scent. your fridge should smell fresh! 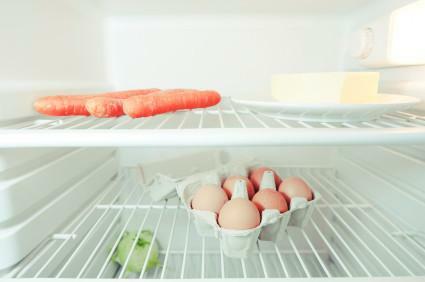 Note: When done, dry the fridge completely to avoid any mold or mildew problems. 5. Newspaper. Crumple up your favorite daily, spritz the crumpled pages with water, and then throw them in your fridge overnight. The newspaper will deodorize the fridge. 6. Coffee grounds. Place a couple of bowls full of fresh coffee grounds in your fridge. After a few days, the smell should be completely absorbed by the grounds. Note: Once your fridge smells sweet, toss the grounds. They will not make a great-tasting cup of Joe. 7. Baking soda. Spread a full box of baking soda on a baking sheet and slide the sheet into the refrigerator – the baking soda will nullify the odor. Tip: Afterwards, add a box of soda to your fresh-smelling fridge to prevent future stink. not a fan of the smell of vinegar, don’t worry. The smell dissipates. unused charcoal in several small bowls, and then set the bowls throughout your fridge. Close your fridge. After a few days, toss the charcoal. Your fridge will be stench-free!